Throughout this semester, our discussions have continually eluded to the idea of “geologic time”. In essence, a geologist’s definition of time is one that encompasses the entire duration of Earth’s history (or about 4.6 billion years!). Key events in geologic time include the formation of Earth, the formation of the first rocks, the evolution of life, and the occurrence of mass extinction events. Geologic time is astonishingly vast, and even people who think on these timescales regularly still have difficulty grasping the enormity of deep time. Understanding geologic time, however, is critical to our ability to understand and evaluate the idea of the Anthropocene. Putting humans and their impacts in context of Earth history can be both a humbling and frightening exercise that simultaneously makes us feel incredibly trivial and surprisingly powerful. Since we are nearing the end of the semester, we will spend some time during class this week attempting to place the Anthropocene in context of geologic time; we will do a timeline exercise that will hopefully be fun and thought-provoking. 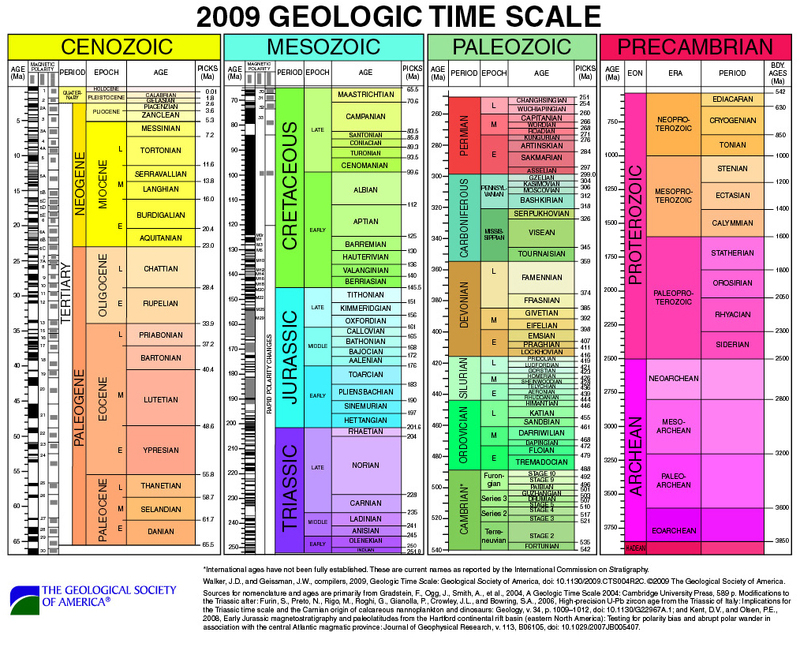 In preparation for class on Thursday, please take a quick look at the official geologic timescale from the Geological Society of America (see below). In particular, note how different divisions of time (eons, eras, periods, epochs) are nested within one another. Note also that the four panels are not drawn to scale! On Thursday, we will spend some time trying to place the events we’ve discussed so far this semester within this timescale.